Struktura nikotinskog acetilholinskog receptora (nAchR: PDB: 2BG9​) koji je veoma sličan sa GABAA receptorom. Gore: bočni pogled na nAchR unutar ćelijske membrane. Dole: pogled na receptor sa spoljašnje strane membrane. Podjedinice su obležene po GABAA nomenklaturi. Približne lokacije GABA i benzodiazepinskog (BZ) mesta vezivanja su označene (između α- i β-podjedinica i između α- i γ-podjedinica respektivno). ^ Richter L, de Graaf C, Sieghart W, Varagic Z, Mörzinger M, de Esch IJ, Ecker GF, Ernst M (2012). „Diazepam-bound GABAA receptor models identify new benzodiazepine binding-site ligands”. Nat. Chem. Biol. 8 (5): 455—464. PMC 3368153  . PMID 22446838. doi:10.1038/nchembio.917. ^ Campagna-Slater V, Weaver DF (2007). 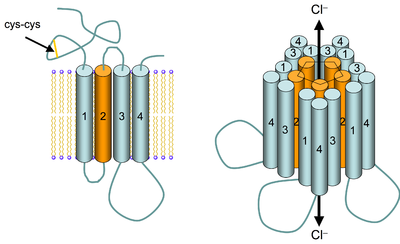 „Molecular modelling of the GABAA ion channel protein”. J. Mol. Graph. Model. 25 (5): 721—30. PMID 16877018. doi:10.1016/j.jmgm.2006.06.001. ^ Sancar F, Ericksen SS, Kucken AM, Teissére JA, Czajkowski C (2007). „Structural Determinants for High-Affinity Zolpidem Binding to GABA-A receptors”. Mol. Pharmacol. 71 (1): 38—46. PMC 2583146  . PMID 17012619. doi:10.1124/mol.106.029595. ^ Santhakumar V, Wallner M, Otis TS (2007). „Ethanol acts directly on extrasynaptic subtypes of GABAA receptors to increase tonic inhibition”. Alcohol. 41 (3): 211—21. PMC 2040048  . PMID 17591544. doi:10.1016/j.alcohol.2007.04.011. ^ Johnston GAR (1996). „GABAA Receptor Pharmacology”. Pharmacology and Therapeutics. 69 (3): 173—198. PMID 8783370. doi:10.1016/0163-7258(95)02043-8. Olsen RW, DeLorey TM (1999). „Chapter 16: GABA and Glycine”. Ур. : Siegel GJ, Agranoff BW, Fisher SK, Albers RW, Uhler MD. Basic neurochemistry: molecular, cellular, and medical aspects (Sixth изд.). Philadelphia: Lippincott-Raven. ISBN 0-397-51820-X. Olsen RW, Betz H (2005). „Chapter 16: GABA and Glycine”. Ур. : Siegel GJ, Albers RW, Brady S, Price DD. Basic Neurochemistry: Molecular, Cellular and Medical Aspects (Seventh изд.). Boston: Academic Press. стр. 291—302. ISBN 0-12-088397-X. Ова страница је последњи пут уређена на датум 23. октобар 2016. у 16:37 ч.